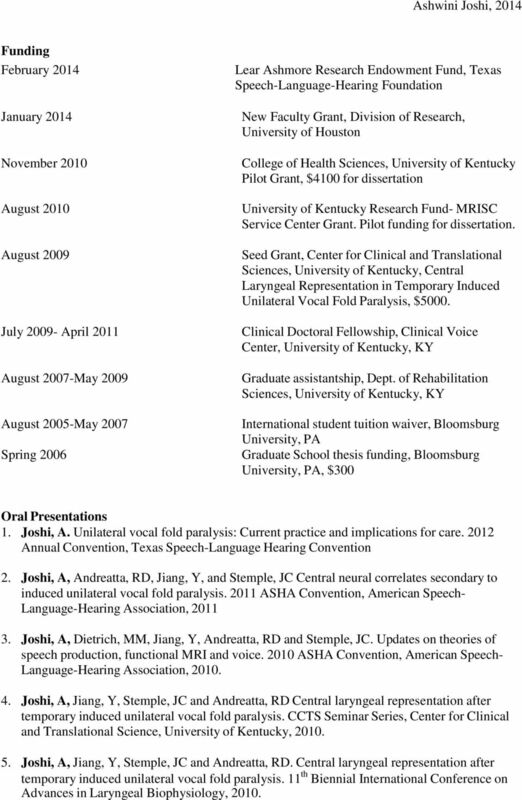 Download "Ashwini Joshi, Ph.D., CCC-SLP"
1 Ashwini Joshi, Ph.D., CCC-SLP Education Doctor of Philosophy (Rehabilitation Sciences) August 2007 to June 2011 University of Kentucky, Lexington, KY Dissertation: Central Neural and Behavioral Correlates of Voice Secondary to Induced Unilateral Vocal Fold Paralysis. Primary Advisor: Joseph C. Stemple, Ph.D., CCC-SLP, ASHAF Certificate in Clinical and Translational Science May 2010 University of Kentucky, Lexington, KY Master of Science (Speech Language Pathology) August 2005 to May 2007 Bloomsburg University, Bloomsburg, PA Thesis: Effects of Elicitation Control on the Respiratory and Phonatory Control Characteristics of Voice Primary Advisor: Shaheen N. Awan, Ph.D., CCC-SLP, ASHAF Bachelor of Science (Hearing, Language Science) June 2001 to July 2005 Ali Yavar Jung, National Institute for the Hearing Handicapped, Mumbai, India Licensure Licensed by the State of Texas in Speech Language Pathology, August 2011-December Certificate of Clinical Competence-Speech Language Pathology, American Speech-Language- Hearing Association, February Clinical/ Work Experience Assistant Professor University of Houston, Houston, TX August 2013-current Responsible for teaching undergraduate and graduate classes Perform research in the field of voice and voice disorders Participate in course development, graduate clinic supervision and other administrative responsibilities as needed. 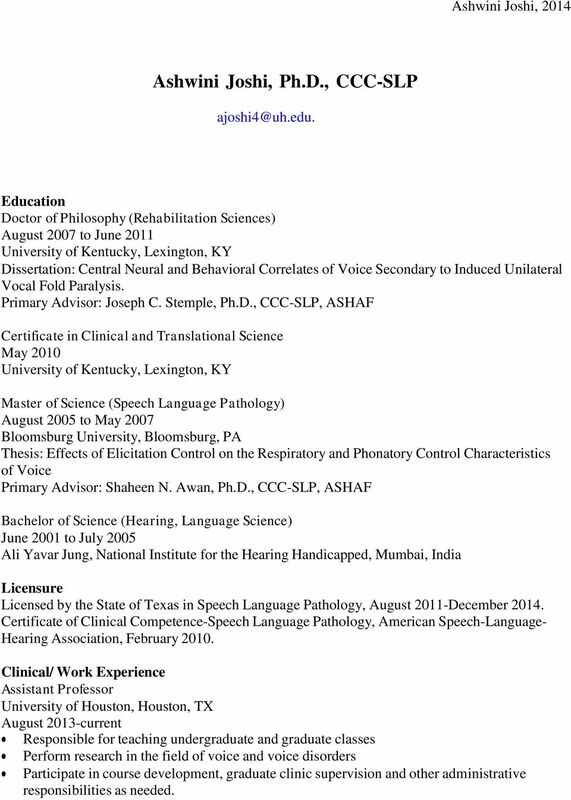 2 Speech Language Pathologist Rehab Care, Houston, TX October August 2013 Primarily responsible for assessment and management of persons with dysphagia, brain injury, Parkinson s disease, dementia and other cognitive impairments in a skilled nursing facility. Clinical Fellow supervisor Clinical Doctoral Fellowship/Assistantship (Speech Language Pathologist) Clinical Voice Center, University of Kentucky July April 2011 Assessment and treatment of voice disorders. Experienced in rigid and flexible stroboscopy, auditory-perceptual, acoustic and aerodynamic assessments, vocal function exercises and resonant voice therapy. Worked as part of an interdisciplinary team with otolaryngologists at the ENT Clinic, University of Kentucky. Clinical Fellowship (CF) towards ASHA CCC-SLP Dept. of Communication Sciences and Disorders, University of Kentucky March July 2008 Clinical Voice Center, University of Kentucky July October 2009 Externship January May 2007 Geisinger Medical Center, Danville, PA Assessment and treatment of dysphagia and cognitive language disorders in an acute care setting Assessment and treatment of child language disorders, articulation, fluency, motor speech disorders, cognitive language disorders and dysphagia for the inpatient and outpatient pediatric population Graduate Assistant Joseph C. Stemple, Dept. of Communication Sciences and Disorders, University of Kentucky August May 2009 Assessment and treatment of persons with voice disorders, writing of proposals for IRB approval, data collection and analyses for multiple research studies, troubleshooting of lab equipment and assistance with teaching of graduate courses in voice disorders and swallowing disorders. Internship July July 2005 Hospitals and schools in Mumbai, Bhopal, Rajkot and Kolhapur (India) Conducted neonatal audiological screenings, screenings for hearing and speech impairments and audiological evaluations, hearing aid trials and speech language evaluations. 3 Provided speech language therapy for populations inclusive of children and adults with hearing impairment, cognitive delays, pervasive developmental disorders, voice disorders, cancer of the oral structures, laryngectomee, aphasia and traumatic brain injury. Conducted training sessions for grass root level social workers to increase awareness of speech disorders Teaching Semester Topic 2014 Fall Anatomy & Physiology for Commn Sciences & Dis Spring Speech Science 2013 Fall Anatomy & Physiology for Commn Sciences & Dis Spring Aerodynamic evaluation of voice 2009,2008,2007 Fall Bedside assessment of swallowing 2009 Spring Speech Science (Teaching Apprenticeship) 2009 Spring Voice disorders (Graduate Assistant) 2008 Spring Acoustic evaluation of voice, Craniofacial disorders Research current The Effects of Voice Therapy in Student Teachers of Music Education current Central Neural and Behavioral Correlates of Voice Secondary to Induced Unilateral Vocal Fold Paralysis Normative data collection for validation of Voice Evaluation Suite, Vocal Innovations Inc An fmri study of the central laryngeal representation in normal voice. Awards May 2012 Employee of the month-therapy, West Oaks Rehabilitation and Healthcare Center, Houston, TX. 2010, 2009, 2008 Graduate School Travel Award, University of Kentucky, $ , 2008 Dept. of Rehabilitation Sciences Travel Award, University of Kentucky, $ International Student Scholarship, American Speech-Language-Hearing Foundation, $ International Conference for Advances in Laryngeal Biophysiology Travel Award, $ American Speech Language Hearing Association, Research Mentoring Pair Travel Award, $750. 4 Funding February 2014 January 2014 November 2010 August 2010 August 2009 July April 2011 August 2007-May 2009 August 2005-May 2007 Spring 2006 Lear Ashmore Research Endowment Fund, Texas Speech-Language-Hearing Foundation New Faculty Grant, Division of Research, University of Houston College of Health Sciences, University of Kentucky Pilot Grant, $4100 for dissertation University of Kentucky Research Fund- MRISC Service Center Grant. Pilot funding for dissertation. Seed Grant, Center for Clinical and Translational Sciences, University of Kentucky, Central Laryngeal Representation in Temporary Induced Unilateral Vocal Fold Paralysis, $5000. 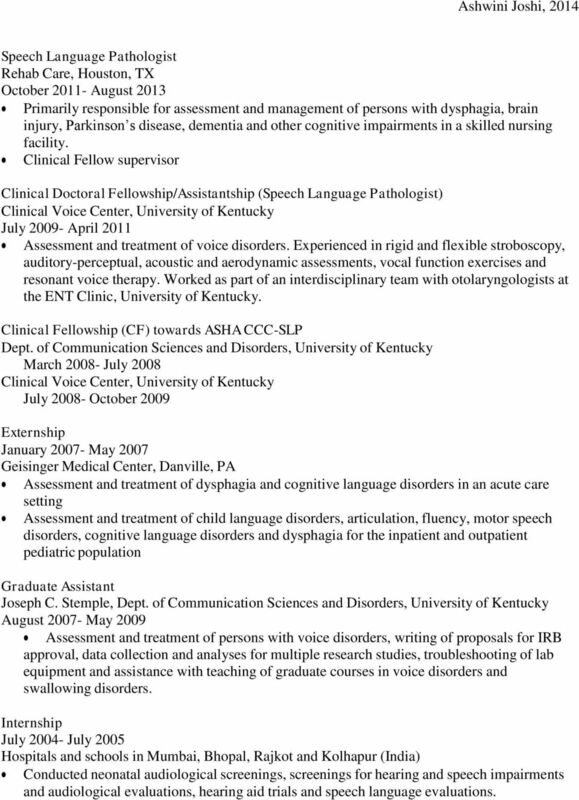 Clinical Doctoral Fellowship, Clinical Voice Center, University of Kentucky, KY Graduate assistantship, Dept. of Rehabilitation Sciences, University of Kentucky, KY International student tuition waiver, Bloomsburg University, PA Graduate School thesis funding, Bloomsburg University, PA, $300 Oral Presentations 1. Joshi, A. Unilateral vocal fold paralysis: Current practice and implications for care Annual Convention, Texas Speech-Language Hearing Convention 2. Joshi, A, Andreatta, RD, Jiang, Y, and Stemple, JC Central neural correlates secondary to induced unilateral vocal fold paralysis ASHA Convention, American Speech- Language-Hearing Association, Joshi, A, Dietrich, MM, Jiang, Y, Andreatta, RD and Stemple, JC. 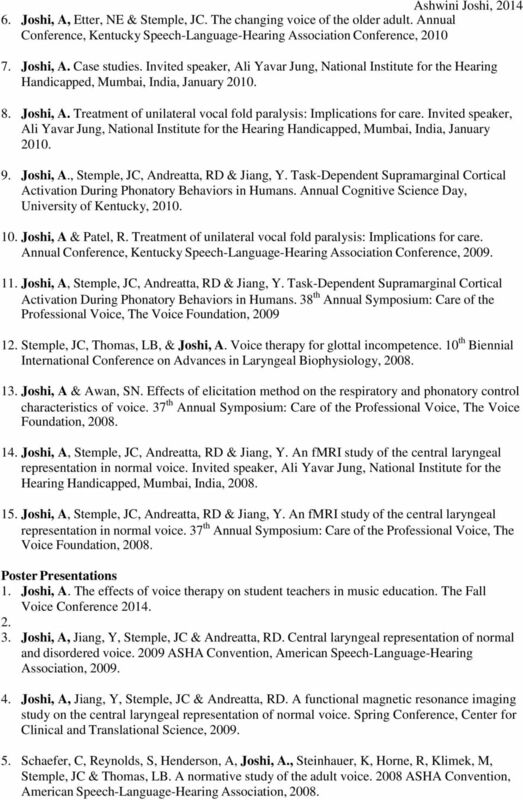 Updates on theories of speech production, functional MRI and voice ASHA Convention, American Speech- Language-Hearing Association, Joshi, A, Jiang, Y, Stemple, JC and Andreatta, RD Central laryngeal representation after temporary induced unilateral vocal fold paralysis. CCTS Seminar Series, Center for Clinical and Translational Science, University of Kentucky, Joshi, A, Jiang, Y, Stemple, JC and Andreatta, RD. Central laryngeal representation after temporary induced unilateral vocal fold paralysis. 11 th Biennial International Conference on Advances in Laryngeal Biophysiology, 2010. 5 6. Joshi, A, Etter, NE & Stemple, JC. The changing voice of the older adult. Annual Conference, Kentucky Speech-Language-Hearing Association Conference, Joshi, A. Case studies. Invited speaker, Ali Yavar Jung, National Institute for the Hearing Handicapped, Mumbai, India, January Joshi, A. Treatment of unilateral vocal fold paralysis: Implications for care. Invited speaker, Ali Yavar Jung, National Institute for the Hearing Handicapped, Mumbai, India, January Joshi, A., Stemple, JC, Andreatta, RD & Jiang, Y. Task-Dependent Supramarginal Cortical Activation During Phonatory Behaviors in Humans. Annual Cognitive Science Day, University of Kentucky, Joshi, A & Patel, R. Treatment of unilateral vocal fold paralysis: Implications for care. Annual Conference, Kentucky Speech-Language-Hearing Association Conference, Joshi, A, Stemple, JC, Andreatta, RD & Jiang, Y. Task-Dependent Supramarginal Cortical Activation During Phonatory Behaviors in Humans. 38 th Annual Symposium: Care of the Professional Voice, The Voice Foundation, Stemple, JC, Thomas, LB, & Joshi, A. Voice therapy for glottal incompetence. 10 th Biennial International Conference on Advances in Laryngeal Biophysiology, Joshi, A & Awan, SN. Effects of elicitation method on the respiratory and phonatory control characteristics of voice. 37 th Annual Symposium: Care of the Professional Voice, The Voice Foundation, Joshi, A, Stemple, JC, Andreatta, RD & Jiang, Y. An fmri study of the central laryngeal representation in normal voice. Invited speaker, Ali Yavar Jung, National Institute for the Hearing Handicapped, Mumbai, India, Joshi, A, Stemple, JC, Andreatta, RD & Jiang, Y. An fmri study of the central laryngeal representation in normal voice. 37 th Annual Symposium: Care of the Professional Voice, The Voice Foundation, Poster Presentations 1. Joshi, A. 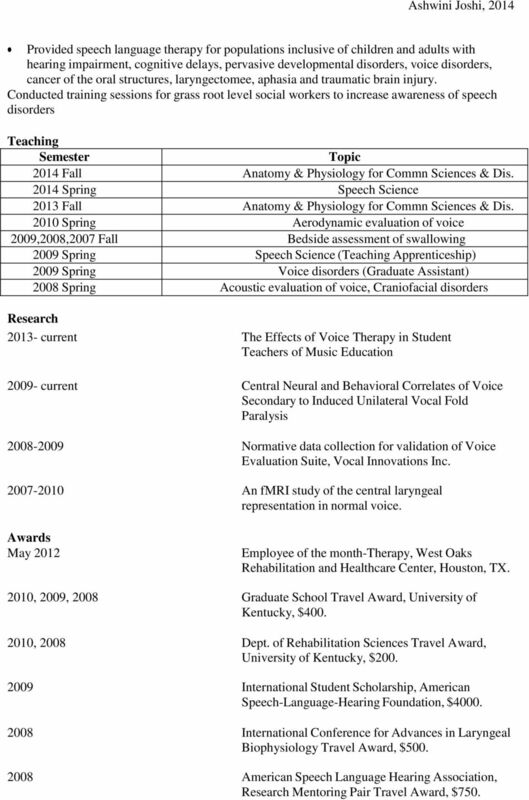 The effects of voice therapy on student teachers in music education. The Fall Voice Conference Joshi, A, Jiang, Y, Stemple, JC & Andreatta, RD. Central laryngeal representation of normal and disordered voice ASHA Convention, American Speech-Language-Hearing Association, Joshi, A, Jiang, Y, Stemple, JC & Andreatta, RD. A functional magnetic resonance imaging study on the central laryngeal representation of normal voice. Spring Conference, Center for Clinical and Translational Science, Schaefer, C, Reynolds, S, Henderson, A, Joshi, A., Steinhauer, K, Horne, R, Klimek, M, Stemple, JC & Thomas, LB. A normative study of the adult voice ASHA Convention, American Speech-Language-Hearing Association, 2008. 6 Publications 1. Dietrich, MM, Yang, J, Andreatta, RD, Joshi, A, and Stemple, JC. Preliminary findings on the relation between the personality trait of stress reaction and the central neural control of human vocalization. 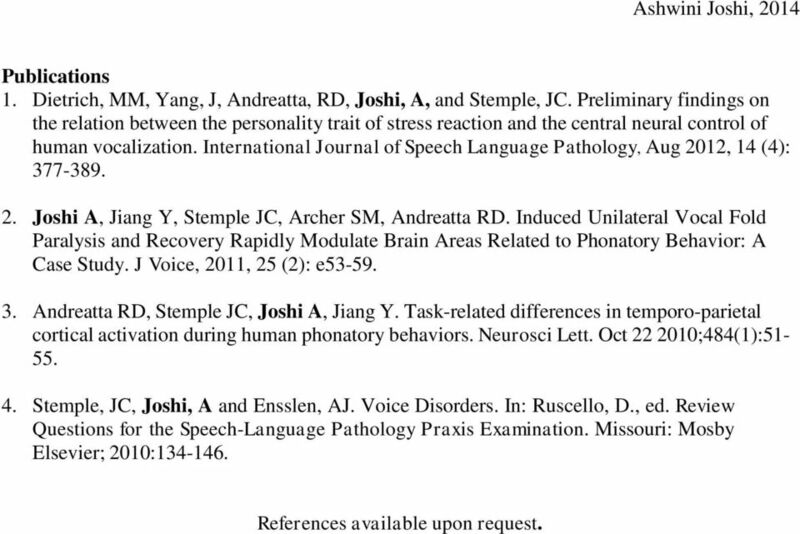 International Journal of Speech Language Pathology, Aug 2012, 14 (4): Joshi A, Jiang Y, Stemple JC, Archer SM, Andreatta RD. Induced Unilateral Vocal Fold Paralysis and Recovery Rapidly Modulate Brain Areas Related to Phonatory Behavior: A Case Study. J Voice, 2011, 25 (2): e Andreatta RD, Stemple JC, Joshi A, Jiang Y. Task-related differences in temporo-parietal cortical activation during human phonatory behaviors. Neurosci Lett. Oct ;484(1): Stemple, JC, Joshi, A and Ensslen, AJ. Voice Disorders. In: Ruscello, D., ed. Review Questions for the Speech-Language Pathology Praxis Examination. Missouri: Mosby Elsevier; 2010: References available upon request. 1. a) An application form (p.2). YOU WILL BE REQUIRED TO UPDATE THIS INFORMATION PRIOR TO THE INITIATION OF YOUR HEALTHCARE EXTERNSHIP. ROSEMARY A. LESTER, M.A., CCC-SLP Department of Speech, Language, and Hearing Sciences University of Arizona P.O. Box 210071 Tucson, Arizona 85721 (520) 621-1644 ralester@email.arizona.edu EDUCATION Ph.D.